Beaded bags can be elegant accessories or decorative gift covers. If you can sew a straight seam and work a simple up and down stitch, you can make your own beaded bags for any purpose or occasion. Select thin fabric to make stitching the beaded bags easier. If you don’t have a sewing machine, join the seams with fusible bond. Get creative with your holiday packaging or make a designer style tote; beaded bags are always in style. Cut a section of fabric twice as long as the desired height of your bag, plus 2 inches. Trim the width of the fabric equal to the desired width of the bag, plus 2 inches. Place the fabric faceup on a flat work surface. Trace the desired stencil designs onto the fabric with a washable fabric marker. The stencil is the pattern for the beaded design on the bag. Make sure to leave a 1-inch clearance around the perimeter of the bag so you can sew the bag together. Thread a beading needle with 4 feet of waxed beading thread. Double the thread and knot the ends. Insert the needle through the back of the fabric to the front along the outline of one of the stenciled areas. Thread a bead over the needle to the fabric. 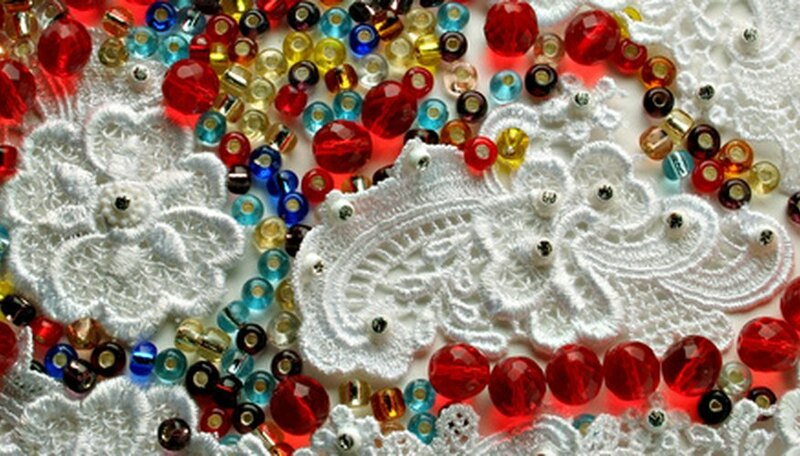 Seed beads and crystal, wood, ceramic or plastic beads up to 8 mm are good choices for making beaded bags. Larger beads may be too chunky. Hold the bead against the fabric and insert the needle back down through the fabric as it exits the bead. Repeat steps 4 and 5 to cover the stenciled design with beads. Fold the beaded fabric in half, face to face. Fold and pin the individual strips of fabric 1 inch from the top of the bag. Pin the remaining three sides of the fabric together, 1 inch from the outside edge. Iron the top seams flat. Stitch the top seams down separately. Stitch the three sides together. Remove the pins as you sew. The design is similar to a pillowcase. Flip the bag inside out so that the beaded design is visible. Cut two sections of self-adhesive interlocking strips to fit along the inside rim of the bag. Connect the strips together. Remove the protective backing from one side and press the strip along the inside rim of the fabric. Remove the remaining protective backing strip. Press the opposite side of the bag against the interlocking strip.